The method that sends raw key codes is private — that is, only available to other parts of the library, not the user. This is easily fixable, however, by modifying the standard library. On the Mac, the location of the file is (by default) /Applications/Arduino.app/Contents/Resources/Java/hardware/arduino/cores/arduino/USBAPI.h; it will have a similar path on other platforms, at least from hardware/ on. Note that this will make the sendReport() method available on an official Arduino board, but other boards may have their own version of USBAPI.h that will also need changing. For example, the version for SparkFun’s ProMicro boards is located in ~/Documents/Arduino/hardware/SF32u4_boards/cores/arduino/. Again, that’s the path on the Mac; it’ll be somewhat different under Windows or Linux. Exposing sendReport() is only part of the solution. If you look at the method’s signature, you can see that it takes a KeyReport pointer as an argument. 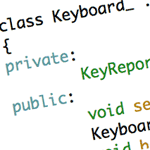 To generate the KeyReport, I cribbed some code from someone else’s project, namely their sendKey() function. Ultimately, I didn’t use their sendKey() entirely verbatim, but enough so that credit is due.